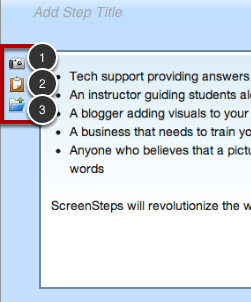 Learn what those icons are next to images in ScreenSteps. Replace Image - click this icon to capture an image and insert it into the current step. The current image will be removed but the annotations will stay in place. This is a great tool for when you need to update documentation for a new interface. Export to Clipboard - copies the image along with annotations to the clipboard ready to be pasted into another application. Export to File - exports the images with annotations to a file. At the bottom of each step image a percentage is displayed (1). This percentage represents the working size of the step image. The working size is the size that is displayed in ScreenSteps and that will be used when you export*. For example, if you capture a screenshot of your software that is 800 x 600 pixels you may only want to export the image at 400 x 300 pixels. By selecting 50% from the drop-down menu the image would display at 400 x 300 pixels in ScreenSteps and would also be output at this size. If you need to quickly resize your image so that it is as large as possible while still fitting within the maximum dimensions you've defined in your preferences then select Scale to Fit Constraints In Preferences (2). To modify the output dimensions of a step image click on the triangle (3) and make a selection from the menu that appears. *Note: Images will sometimes be downsized if they cannot fit within the maximum width or height allowable for the export option chosen. When exporting to HTML (as of version 2.0.3) or ScreenSteps Live the downsized image will be displayed in the lesson and a Zoom link will appear which will open the full-size image in a new window. If you place the mouse cursor over the image resize control a tooltip will appear showing the original image dimensions and the dimensions you have set for output. When you resize an image you may or may not want to scale the annotations as well. For example, if you are updating a screenshot you most likely do not want to scale the annotations, you just want to reposition them after the updated screenshot is inserted. 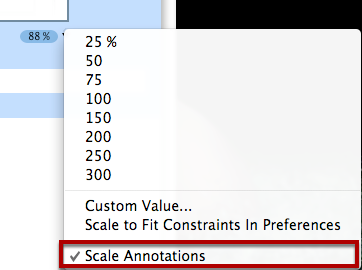 To toggle whether or not annotations are scaled when resizing an image just select Scale Annotations from the menu. 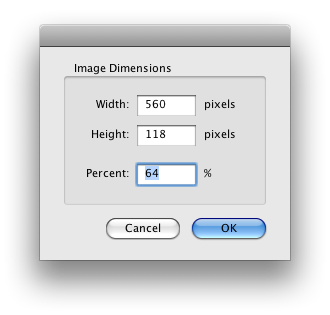 The resize menu provides some default percentages that you can use to resize your image. 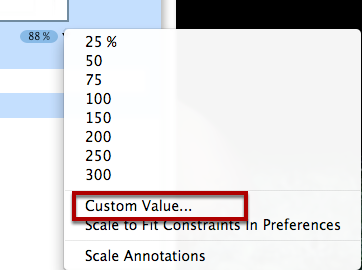 If you need more control over the dimensions select "Custom Value" from the menu. 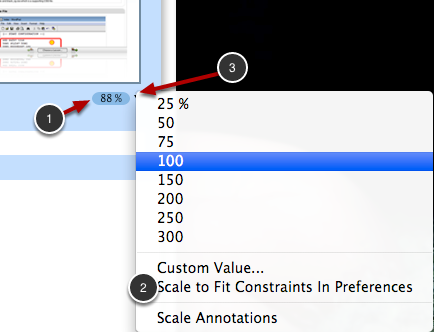 This dialog will appear allowing you to enter a custom percentage or height/width values. Next: How do I Change the Layering of Annotations?